THE gale had been blowing for days and there was not a lifeboat crew on the whole North-East coast that was not out on the boiling sea risking their lives to rescue lost souls. These were the days when isolated coastal settlements looked after their own – and lifeboat stations were often stand-alone organisations rather than under the wing of the fledgling RNLI. But as tragedy began to unfold at Whitby on February 9, 1861, all of that was about to change. By the end of that day the Yorkshire port would be mourning the loss of a dozen lives and the maritime rescue service would never be the same again. This week those painful memories will be recalled as Whitby and lifeboatmen from its sister ports come together to remember those 12 forebears who died 150 years ago in one of the region’s worst lifeboat disasters. During the great storm when more than 200 ships were wrecked on the east coast, Whitby’s lifeboat capsized with the loss of all but one of the crew. The sole survivor was Henry Freeman, who was to become a hero years later of lifeboating’s most famous story – the hauling of Whitby’s lifeboat over the North York Moors to Robin Hood’s Bay to enable it to be launched on another lifesaving mission. Mr Freeman, then a young man in his early 20s, was on his first lifeboat launch. Skipper John Storr, who was to die with his son, tossed Mr Freeman, as the youngest member of the crew, a new fangled lifevest that had been sent as a sample to Whitby Lifeboat Association by the RNLI in an attempt to persuade stubborn local rescue stations that better equipment could be provided by a national body. The other men in the crew preferred to rely on their tried and trusted belts, filled with ballast. But as events would tragically demonstrate, a full chest vest would prove much more efficient in keeping casualties upright and breathing in the heaving seas. Mr Freeman, the only man wearing the new design cork lifejacket, was awarded an RNLI Silver Medal and went on to become Whitby’s most renowned lifeboatman, helping save more than 300 lives during more than 20 years as the port’s RNLI coxswain. To commemorate the 150th anniversary of the tragedy and the 12 men who died, there will be a short service of remembrance on Wednesday at Whitby lifeboat station. Whitby’s all-weather lifeboat George and Mary Webb and the 1909 restored pulling lifeboat William Riley will be launched and descendants of those lost will help scatter roses at the spot where the lifeboat capsized. 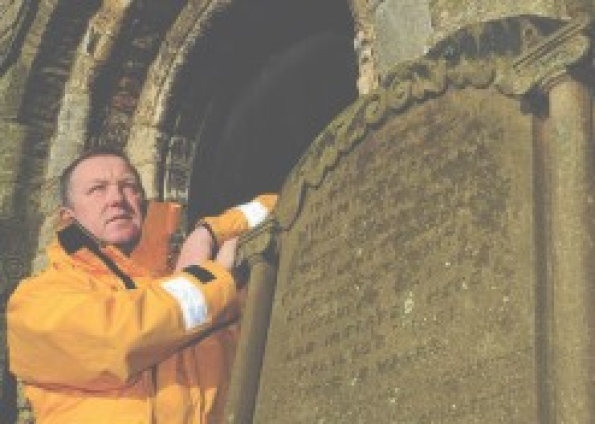 On Sunday at St Mary’s Church, a service of commemoration will be attended by the lifeboat crew and the Bishop of Whitby. Marske Fishermen’s Choir will perform a song written about the disaster. Whitby coxswain Mike Russell said the lifeboat disaster had a huge impact on the town and led to the North Yorkshire town’s lifeboat service being taken over by the RNLI. He added: “When I think about the lifeboats, the equipment and the training the RNLI gives us today, it’s hard to imagine these men went to sea in such a terrific storm in an open rowing boat. The whole town was in mourning for the men, who are commemorated on a memorial in St Mary’s. Mr Freeman’s bust is now on the wall of the lifeboat station. “So the current crew think about him and his colleagues who never made it back every time we launch our lifeboat,” added Mr Russell. Soon after the disaster, the local lifeboat committee asked the RNLI to take over the service in Whitby, providing a new self-righting lifeboat and lifejackets. A fund was organised to help care for the 10 widows and 44 children of those who died, raising more than £5,000. The twelve who died were John Storr, William Storr, John Dixon, Robert Leadley, Matthew Leadley, Robert Harland, William Walker, Isaac Dobson, John Philpot, William Tyreman, George Martin and Christopher Collins.